We’ve all been there. It’s school holidays, it’s scorching hot and you’re weighing up your options: stay inside in the air con or risk frying the soles of your feet on the concrete to get to the pool to cool off. It’s a tough call, and — particularly now that we’re connected 24/7 — it’s often easier to stay indoors. But as we become more aware of the dangers associated with a sedentary lifestyle, it’s becoming more important to give our kids every opportunity to get outside and get moving. When Abu Dhabi’s 14.5-hectare Mushrif Central Park underwent a two-year makeover, the new design was intended to promote an active lifestyle to build a healthy society. In a city where 45° days are standard in summer, thinking outside the box was a must to get kids out of the air con and into the fresh air. The developers wanted to include a water play area for children but needed a heat-resistant, non-slip surface to ensure the space didn’t turn into a frying pan. They found an answer in PolySoft seamless paving. Soft and comfortable underfoot, the surface stays cooler than other options like concrete, asphalt and rubber, meaning kids can play comfortably, even on the hottest of days. But the hot weather didn’t just pose a problem for sensitive little feet. Tanseeq, the company that installed the children’s playground feature, worked in shifts from the late afternoon to midnight to lay the 186 m2 of water-play area as the searing daytime heat made it difficult to maintain surface levels. A total of 10 colours of PolySoft granules were used to achieve three dominant colour zones. Syed A Wajid, general manager of Tanseeq, said the overall effect is “very clean and pleasing”. This was the first project for which Tanseeq used PolySoft — and they’re happy with the results. 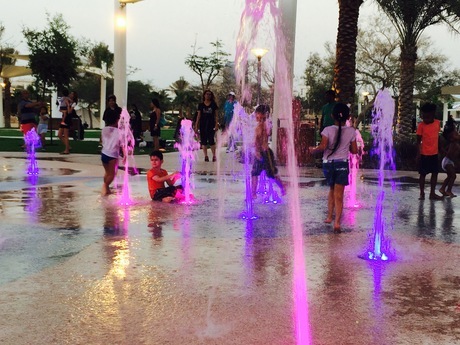 Given that Mushrif Central Park is “possibly the most advanced park in Abu Dhabi, following this development”, according to Wajid, up-to-date materials that will stand the test of time were required. “Compared to standard rubberised flooring, PolySoft certainly is a more sophisticated product. [It] is more durable and colour-stable, owing to the use of high-quality resin binders and polyolefin granules,” Wajid said. PolySoft is installed using a combination of flexible and durable coloured polyolefin granules and an aliphatic polyurethane binder that has been formulated to meet strict quality guidelines. Coupled with colourfast technology, this protects against premature fading and provides excellent resistance to UV radiation and chemicals such as chlorine. Aquatic environments present a unique set of issues that PolySoft has worked hard to address. The company’s PolySoft Plus and PolySoft Extra products are designed specifically for aquatic environments like splash pads, pool surrounds, water playgrounds, waterslide entrances and hydrotherapy pool concourses. The Plus system has been formulated to hinder the growth of fungi and algae that are prevalent in moist and warm environments, while the Extra system is designed for high-impact areas such as the point of impact from dump buckets. It also ticks boxes in terms of sustainability — no longer just an optional extra in today’s market. PolySoft is 100% recyclable and derives 40% of its materials from natural resources. “PolySoft has shown its adaptability to different cultural and climatic environments in the Middle East, Asia, USA and Australia,” said Ophelia Zhu, PolySoft’s CEO.